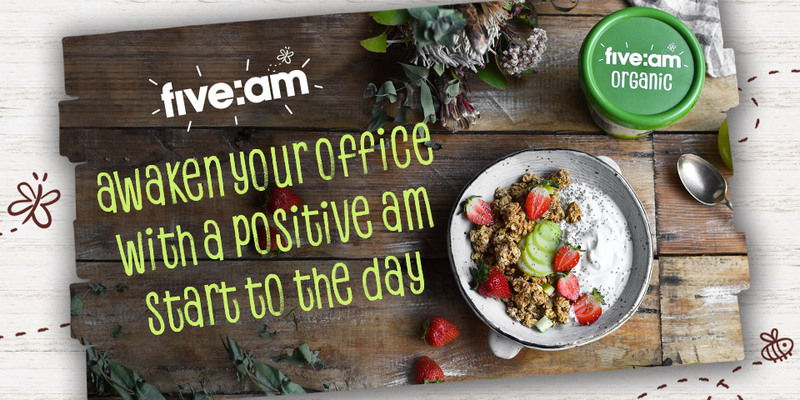 Win a breakfast for your workplace! Tell us in 25 words or less why you want to awaken your amazing for your office? All valid entries will be judged (by representatives of the Promoter) on originality, creativity and suitability or as otherwise specified by the Promoter (in the Promoter’s sole and absolute discretion). • A ‘Five:AM Breakfast’ for your workplace, on a date and at a time to be determined by the Promoter (in its sole and absolute discretion) between Wednesday 24 October 2018 and Wednesday 31 October 2018, valued at up to $200 (incl GST). Entrants and their companions must be able to take the prize between Wednesday 24 October 2018 and Wednesday 31 October 2018 as determined by the Promoter (in its sole and absolute discretion) in consultation with the prize winner. Dates and schedules of the prize are not under the Promoter’s control and are subject to change. The Promoter takes no responsibility for any date or schedule changes. Up to $600 (incl GST). The prize will be delivered to the winner's business address by representatives of the Promoter.